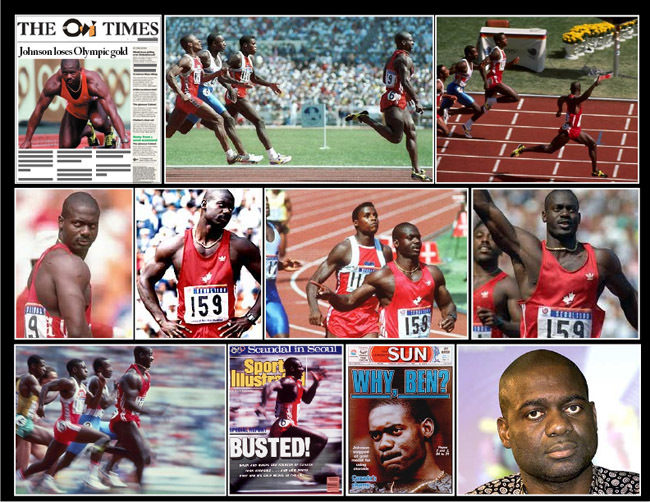 September 27th 1988; Sprinter Ben Johnson has been sent home from the Seoul Olympic Games in disgrace. The Canadian has also been stripped of his 100m gold medal after testing positive for drugs. Johnson has just arrived home in Toronto and has said he will appeal against the International Olympics Committee's verdict. But the IOC has already said the athlete's intended defence - that a herbal drink he consumed before the race had been spiked - will not be accepted. Samples of Johnson's urine were tested for drugs immediately after the 100m final three days ago which he won in a world record time of 9.79 seconds. And Olympic officials confirmed last night that traces of the anabolic steroid, Stanozol, had been detected. The sprinter was woken in the early hours of the morning to be told the IOC had decided to send him home.